and Who ordained for the moon stages until it becomes again as an old dry palm branch! O Light of every light! O ultimate goal of all desires! O Source of all graces! O One and Only! O One! O Single! turning to You, and success to that to which You led Mu¦ammad and the Household of Mu¦ammad, peace be upon him and them. Who decided it to be better than one thousand months! the earth, and the heavens! O Allah! O wonderful Originator! turning to You, and success to that to which You led Muhammad and the Household of Mu¦ammad, peace be upon him and them. and the sun and the moon for reckoning! O Allah! O Single! O Singular! O Allah! O Evident! O Immanent! O Ever-living! There is no god save You. O Maker of night and daylight two portents! so that you may seek favor and pleasure from Him! O He Who expounds everything with clear expounding! According to narrations, it is recommended to bathe oneself at the twenty-seventh night of Rama¤¡n. It has been also narrated that Imam `Al¢ ibn al-°usayn Zayn al-`ªbid¢n (`a) used to repeat the following prayer throughout this night. The dua seeks 'Tajafi' a state of readiness to leave this material world (eg. as in the congregation prayer when u have joined in 2nd rakat & while in tashahud & are ready to rise up). In this position only the very necessary parts of the body touch the ground ,indicating minimum attachment to the world. and readiness for death before it is too late. then You withdraw it to Us, a gradual withdrawal! There is no god save You! There is no god save You. O All-holy! O (Source of) Peace! O Grantor of security! O Dominant! O Creator! O Maker! O Fashioner! and prevents them from vanishing! O Allah! O Inheritor (of all things)! O Resurrector of those in graves! and makes the day overlap the night! and the Master of masters! You are nearer to me than my life-vein. All praise be to Allah. There is no partner with Him. the might of His Majesty, and as it befits Him. O Glorified! O ultimate goal of glorification! O All-beneficent! O Doer of mercy! O Allah! O All-hearing! O All-seeing! O Allah, bless Muhammad and his family. O (One) who draws forth the day from the night, and lo! we are in darkness. O (One) who causes the sun to travel its appointed place, through Your decree, O the Mighty, the All­knowing. and who decreed stages for the moon, till it returns bent like a palm tree. O the Light of all lights, and the ultimate goal of all desires, and the Guardian of all blessings, O Allah, O Beneficent. O Allah, O Holy, O One, O (the) Unique, O (the) Single O Allah, O Allah, O Allah, You have the most beautiful names, the highest examples, the grandeur, the bounties. I beseech You to, bless Muhammad and the family of Muhammad, and place my name, in this night, among the fortunate, and my soul among the martyrs, let my good deeds be (written) in the 'Illiyyin (Book of the virtuous), and my evil deeds be forgiven. (And I beseech You to ) grant me a certainty which gives joy to my heart, and a faith which drives doubt away from me, and make me pleased with what You have granted me. (And I beseech You to) Give us good in this world, and good in the Hereafter, and save us from the punishment of the burning fire. (HQ 2:201) (And I beseech You to) grant me in it (Laylatul Qadr) Your remembrance, and Your gratitude, and desire for (pleasing) You, turning (to You for repentance), and success, for all that You have granted Muhammad and his family, peace be on him and on them. O Allah, bless Muhammad and the family of Muhammad. O the cleaver of the dawn, who made the night for rest, and the sun and moon for calculation (of time). O Mighty, O All­Knowing, The Possessor of; blessings and might, strength and power, grace and favours, and majesty and nobility. O Allah, O Beneficent, O Allah, O (the) Single, O (the) Unique O Allah, O (the) Manifest, O (the) Hidden, O (the) Ever­Living There is no god but You, You have the most beautiful names, the highest examples, the grandeur, the bounties. I beseech You to, bless Muhammad and the family of Muhammad, and place my name, in this night, among the fortunate, and my soul among the martyrs, let my good deeds be (written) in the 'Illiyyin (Book of the virtuous),and my evil deeds be forgiven. (And I beseech You to ) grant me a certainty which gives joy to my heart, and a faith which drives doubt away from me, and make me pleased with what You have granted me. (And I beseech You to) Give us good in this world, and good in the Hereafter, and save us from the punishment of the burning fire. (HQ 2:201) (And I beseech You to) grant me in it (Laylatul Qadr) Your remembrance, and Your gratitude, and desire for (pleasing) You, turning (to You for repentance), and success, for all that You have granted Muhammad and his family, peace be on him and on them. O Allah, bless MUhammad and the family of Muhammad. O (One) who made, the night a covering, and the day for seeking livelihood, and the earth a resting place, and the mountains as pegs. O Allah, O (the) Subduer, O Allah, O (the) Most Powerful O Allah, O All Hearing, O Allah, O (One who is) Near O Allah, O (the One) who Answers O Allah, O Allah, O Allah, You have the most beautiful names, the highest examples, the grandeur, the bounties. I beseech You to, bless Muhammad and the family of Muhammad, and place my name, in this night, among the fortunate, and my soul among the martyrs, let my good deeds be (written) in the 'Illiyyin (Book of the virtuous), and my evil deeds be forgiven. (And I beseech You to ) grant me a certainty which gives joy to my heart, and a faith which drives doubt away from me, and make me pleased with what You have granted me. (And I beseech You to) Give us good in this world, and good in the Hereafter, and save us from the punishment of the burning fire. (HQ 2:201) (And I beseech You to) grant me in it (Laylatul Qadr) Your remembrance, and Your gratitude, and desire for (pleasing) You, turning (to You for repentance), and success, for all that You have granted Muhammad and his family, peace be on him and on them. O Allah bless Muhammad and his family. O (One) who made the sun and the moon two signs. O (One) who removed the sign of the night, and made the sign of the day bright, that you may seek grace from Him, and (His) pleasure. O (One) who seperates everything distinctly. O the Magnificent, O (the) Giver, O Allah, O (the) Generous. O Allah, O Allah, O Allah, You have the most beautiful names, the highest examples, the grandeur, the bounties. I beseech You to, bless Muhammad and the family of Muhammad, and place my name, in this night, among the fortunate, and my soul among the martyrs, let my good deeds be (written) in the 'Illiyyin (Book of the virtuous), and my evil deeds be forgiven. (And I beseech You to ) grant me a certainty which gives joy to my heart, and a faith which drives doubt away from me, and make me pleased with what You have granted me. (And I beseech You to) Give us good in this world, and good in the Hereafter, and save us from the punishment of the burning fire. (HQ 2:201) (And I beseech You to) grant me in it Your remembrance, and Your gratitude, and desire for (pleasing) You, turning (to You for repentance), and success, for all that You have granted Muhammad and his family, peace be on him and on them. O Allah, bless Muhammad and the family of Muhammad. O (One) who extended the shadow and had You wished You would have made it stationary. And You made the sun its guide, then You withdrew it to Yourself, an easy withdrawal. O the possessor of generosity and power, grandeur and bounties. There is no god but You, Knower of the unseen and the manifest, The Beneficent, the Merciful. There is no god but You, O Holy, O Peace, O (the) Trusted, O (the) Protector O Mighty, O Most Powerful, O Sublime. O Allah, O Creator, O Originator, O (the) Fashioner, O Allah, O Allah, O Allah, You have the most beautiful names, the highest examples, the grandeur, the bounties. I beseech You to, bless Muhammad and the family of Muhammad, and place my name, in this night, among the fortunate, and my soul among the martyrs, let my good deeds be (written) in the 'Illiyyin (Book of the virtuous), and my evil deeds be forgiven. (And I beseech You to ) grant me a certainty which gives joy to my heart, and a faith which drives doubt away from me, and make me pleased with what You have granted me. (And I beseech You to) Give us good in this world, and good in the Hereafter, and save us from the punishment of the burning fire. (HQ 2:201) (And I beseech You to) grant me in it (Laylatul Qadr) Your remembrance, and Your gratitude, and desire for (pleasing) You, turning (to You for repentance), and success, for all that You have granted Muhammad and his family, peace be on him and on them. O Allah, bless Muhammad and the family of Muhammad. O (One) who keeps safe the night in the atmosphere, and keeps safe the light in the sky, and prevents the sky to fall on the earth except by His permission, and holds them back lest they move away. 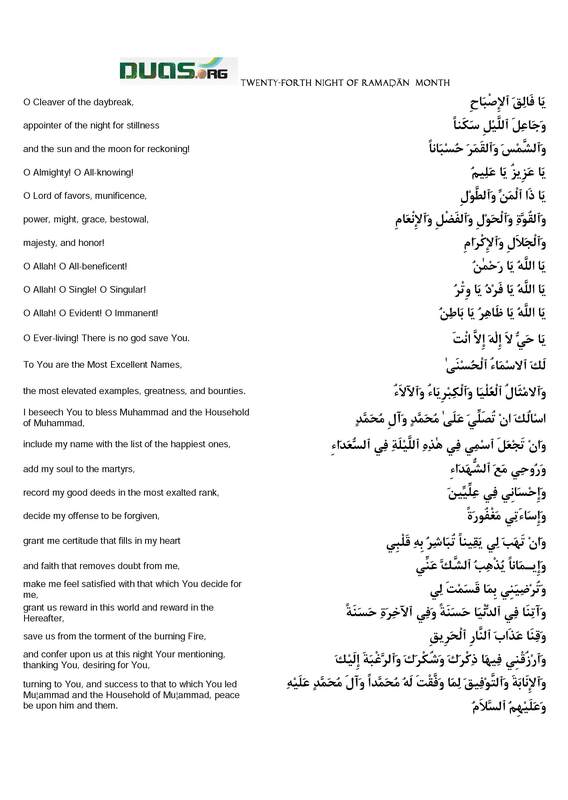 O All­Knowing, O Mighty, O Forgiver, O Eternal, O Allah, O Inheritor, O (One) who will raise those in the graves. O Allah, O Allah, O Allah, You have the most beautiful names, the highest examples, the grandeur, the bounties. I beseech You to, bless Muhammad and the family of Muhammad, and place my name, in this night, among the fortunate, and my soul among the martyrs, let my good deeds be (written) in the 'Illiyyin (Book of the virtuous), and my evil deeds be forgiven. (And I beseech You to ) grant me a certainty which gives joy to my heart, and a faith which drives doubt away from me, and make me pleased with what You have granted me. (And I beseech You to) Give us good in this world, and good in the Hereafter, and save us from the punishment of the burning fire. (HQ 2:201) (And I beseech You to) grant me in it (Laylatul Qadr) Your remembrance, and Your gratitude, and desire for (pleasing) You, turning (to You for repentance), and success, for all that You have granted Muhammad and his family, peace be on him and on them. O Allah, bless Muhammad and the family of Muhammad. O (One) who coils the night into the day, and coils the day into the night. O All­Knowing, O Wise, O the Lord of Lords, and the Chief of chiefs. There is no god but You. O (One) who is nearer to me than my jugular vein. O Allah, O Allah, O Allah, You have the most beautiful names, the highest examples, the grandeur, the bounties. I beseech You to, bless Muhammad and the family of Muhammad, and place my name, in this night, among the fortunate, and my soul among the martyrs, let my good deeds be (written) in the 'Illiyyin (Book of the virtuous), and my evil deeds be forgiven. (And I beseech You to ) grant me a certainty which gives joy to my heart, and a faith which drives doubt away from me, and make me pleased with what You have granted me. (And I beseech You to) Give us good in this world, and good in the Hereafter, and save us from the punishment of the burning fire. (HQ 2:201) (And I beseech You to) grant me in it (Laylatul Qadr) Your remembrance, and Your gratitude, and desire for (pleasing) You, turning (to You for repentance), and success, for all that You have granted Muhammad and his family, peace be on him and on them. O Allah bless Muhammad and the family of Muhammad. All Praise is for Allah, there is no partner for Him. All Praise is for Allah, as is deserved by His glorious countenance, and His mighty power, and as He is worthy of it. O Holy, O Light, O Holy Light. O Glorious, O the ultimate goal of all glorification. O Beneficent, O the doer of mercy. O Allah, O All­Knowing, O Great, O Allah, O Gracious. O Magnificent, O Allah, O All­Hearing, O All­Seeing. O Allah, O Allah, O Allah, You have the most beautiful names, the highest examples, the grandeur, the bounties. I beseech You to, bless Muhammad and the family of Muhammad, and place my name, in this night, among the fortunate, and my soul among the martyrs, let my good deeds be (written) in the 'Illiyyin (Book of the virtuous), and my evil deeds be forgiven. (And I beseech You to ) grant me a certainty which gives joy to my heart, and a faith which drives doubt away from me, and make me pleased with what You have granted me. (And I beseech You to) Give us good in this world, and good in the Hereafter, and save us from the punishment of the burning fire. (HQ 2:201) (And I beseech You to) grant me in it , Your remembrance, and Your gratitude, and desire for (pleasing) You, turning (to You for repentance), and success, for all that You have granted Muhammad and his family, peace be on him and on them.